alaTest has collected and analyzed 72 reviews of Epson Expression Home XP-445. The average rating for this product is 4.2/5, compared to an average rating of 4.0/5 for other products in the same category for all reviews. People are impressed by the size and design. The price and performance also get good feedback, but views about the noise and paper handling are mixed. We analyzed user and expert ratings, product age and more factors. Compared to other products in the same category the Epson Expression Home XP-445 is awarded an overall alaScore™ of 91/100 = Excellent quality. A compact, well-featured all-in-one that’s good at working with PCs and mobile devices alike, but lacking in unique features to set it apart from rivals. 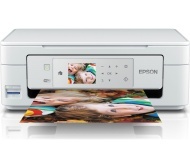 The Epson Expression Home XP-445 is from Epson's mid-range Expression series. This all-in-one turns out excellent colour copies. To find out if it prints just as well, and conserves your ink, read our Epson Expression Home XP-445 review. I only have printed about 10 pages & black cartridge change sign is on. This is not fair. Cracking printer, photos excellent. Got it half price to make it even netter! Pretty easy to set ,prints quickly and cleanly cartridges about £35 a set to OK price ,happy overall. The set up instructions did miss out 2 points which if my son had not been around to guess next move I would have been stumped. Struggled getting paper to fit.